Donald Featherstone, a man with the perfect name for the legacy he left on this earth, has died at the age of 79. 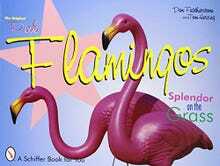 Featherstone designed the plastic lawn flamingo, one of earth’s most useless, beloved and beautiful tchotchkes. Featherstone, the Associated Press reports, died of Lewy body dementia, a type of dementia similar to Alzheimer’s. He came up with the lawn flamingo after finishing art school in the ‘50s while working at the plastics company Union Products, a company he remained at for almost half a century. Sears sold the bird for $2.76 a pair: “Place in garden, lawn, to beautify landscape,” the 1957 catalog read. Working-class homeowners readily planted it on their modest lawns — a nod to the marble or bronze sculpture on vaster properties — and art critics promptly pegged it as a prime example of the despicable spread of kitsch. In the 1960s, the suburban lawn flamingo — cheap, mass-produced, artificial and unusually neon pink — was widely reviled as the dregs of bad taste. At one point, Featherstone had 57 in his backyard, though the flamingo is only one of many plastic lawn ornaments he designed. In 1999, he wrote a book on his creation, entitled The Original Pink Flamingos: Splendor on the Grass. 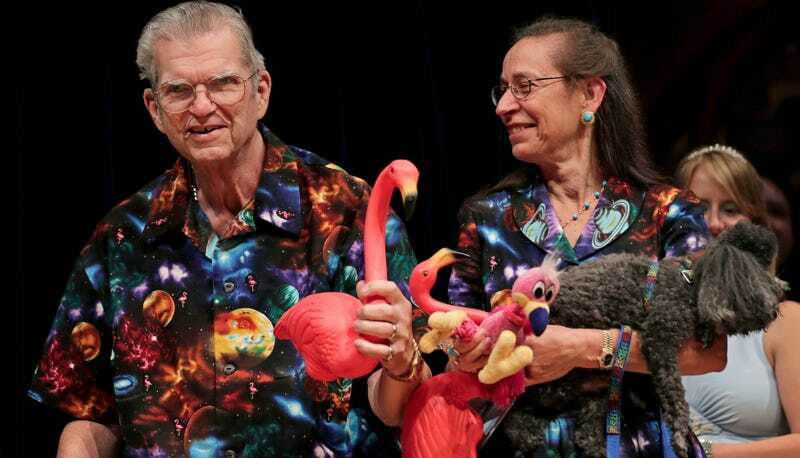 In 2013, Featherstone’s wife Nancy wrote a popular piece for The Guardian about how the two of them dressed in matching outfits for decades (see above). “Whenever I see flamingo fabric, I buy some and make us an outfit; we now have more than 40 in their own special closet,” she wrote. Donald used to have to travel for business and when I packed his case, I’d tell him which outfit to wear on which day, so we coordinated even though we were apart. It helped us feel connected to each other. But his boss realised Donald was much more productive if I came along, too, so I’d help out at the conventions. It was good for business, because people would seek out our stall year after year to see what we were wearing. We don’t like to be apart. Donald proposed on our first date and we’ve been together almost all the time since. If you want to do things by yourself, why get married? Why have separate hobbies? We never argue – Donald says he learned long ago to say, “Yes, dear”, but in fact it’s because we have a strong foundation. Being with him is never an effort. “You know, Donald always said, ‘You don’t take yourself too seriously because you’re not getting out alive anyway,’” said Nancy.